Designed to twist around your wrist several times to create an awesome style statement, leather wrap bracelets are popular on and off the fashion runways. Whether you're looking for something colorful and eye-catching to dress up your favorite jeans or you're hoping to make that lace dress a little edgier, one of these bracelets may be just what you need to complete your outfit. Like any major trend, wrap bracelets come in a variety of different styles, materials, and colors. The following are some of the most popular. 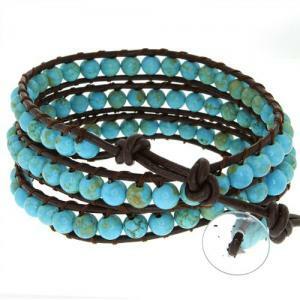 Some wrap bracelets, such as the Chen Rai Turquoise Bead Wrap Bracelet from Eve's Addiction feature two strands of narrow leather cord and stone, glass, or ceramic beads. The beads are held in place on thread that is wrapped around the leather cords, giving a pop of color to the design. Typically, these beaded leather bracelets wrap around the wrist twice and are secured with a button or a large bead. 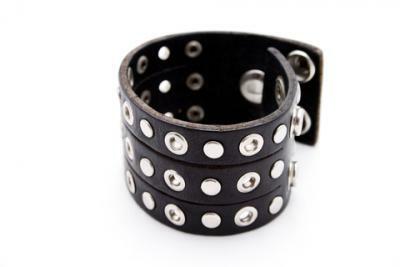 Studded leather can lend an edgy flair to just about any outfit, and wrap bracelets with studs are extremely popular with shoppers. Options like the Leather Wrap Bracelet from Chloe + Isabel mix narrow leather strips with small brass studs for a statement-making piece of jewelry. Many leather wrap bracelets feature statement-making embellishments, such as the feather on this handmade Bohemian Leather Wrap Bracelet from InbalMagenCollection on Etsy. This particular bracelet wraps around the wrist between four times. Wrap bracelets aren't just for women. This simple design is perfect for men's jewelry, too. Retailers like Lucky Dog Leather offer men's wrap bracelets in brown and black leather with chunky hardware and minimal adornment. In addition to being simpler than women's, men's wrap bracelets are usually wider and wrap around the wrist two or three times. Chan Luu offers dozens of beautiful beaded leather wrap bracelets. You'll find gemstones, mother of pearl, and other quality materials in these designs. Prices range from about $100 to about $300. 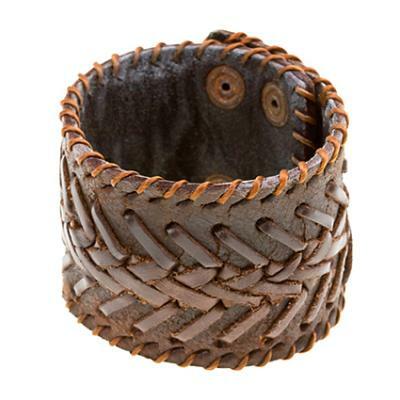 Zappos has over a hundred different styles of wrap bracelets, most of which are constructed of leather. You'll find all the major trends, including beaded wrap bracelets and designs with chunky clasps and charms. Prices vary significantly depending on the designer. Etsy is the place to shop if you're looking for a wrap bracelet that's unique. Artisans craft limited edition and one-of-a-kind wrap bracelets out of all different colors of leather and beads. You can even find designs with quotes imprinted in the leather. Prices vary, but you can find a great bracelet for under $50. Amazon.com also has a great selection of leather wrap bracelets, including designs with beads and charms. Most are affordable, often under $30 apiece. Although they come in a variety of colors, styles, and materials, these bracelets are best for casual wear. Keep these tips in mind when choosing and wearing your wrap bracelet. Contrast the material or tone of your wrap bracelet with your clothing. For instance, if you're wearing a soft chiffon top and jeans, choose a wrap bracelet with studded leather and chunky hardware. Layer your bracelets for an even more dramatic statement, especially if you're wearing short sleeves. You can mix and match different colors and textures to create the ultimate wrist candy. If your leather wrap bracelet is brown or black, be sure to choose a belt, handbag, and shoes that won't clash with your bracelet. For a black bracelet, choose other leather accessories that are black, grey, silver, or another cool color. The exception to this rule is wearing brown and black leather bracelets together. Since wrap bracelets command attention, it's best to keep the rest of your jewelry fairly understated. Don't combine a chunky necklace with a bright wrap bracelet and giant earrings. Instead, wear a simple chain necklace with stud earrings and your beautiful leather bracelet. Leather jewelry and water simply don't mix. Avoid wearing your leather wrap bracelet anywhere it might get wet, such as the beach, the pool, or the spa. With proper care, your wrap bracelet should last for years. No matter which design you choose and how your decide to wear it, a leather wrap bracelet makes an eye-catching and versatile accessory. Invest in more than one so you have a bracelet to go with every outfit.